Whether installing in a new plant or seeking to replace an existing pump, MasoSine SPS pumps offer the ideal solution to improve your performance and minimise cost of ownership. The sinusoidal rotor design of MasoSine SPS pumps delivers a lower shear, gentle pumping action that safely transfers delicate products without risk of degradation. SPS pumps are suitable for sanitary and industrial applications up to 217psi (15 bar) pressure at flows up to 434 GPM (99,000 l/hr). Products with viscosities from 1cP to 8 million cP can be transfered with powerful suction up to 0.85bar. SPS pumps deliver a constant feed of whole foods, meats, dairy products and concentrates. Capable of handling soft solids safely up to 60mm, maintaining end product quality and delivering high yield rates. Maintenance takes minutes and can be performed in-place by a line operative. Replace off-the-shelf wear components to restore to "new pump” performance with no need for re-machining or using oversized parts. 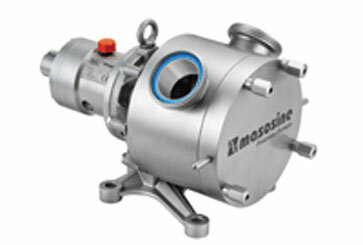 All MasoSine pumps of SPS series have 20 years warranty on housing and front cover. Pressures to 217psi (15 bar). Capacity: to 434 GPM (99,000 litre/hour).